At the end of my review for Season 2, Episodes 1 & 2 I said the second season hadn't drawn me in as intensely as the first season. Then Episode 3 aired. I couldn't take my eyes off the screen for an instant. As soon as the third episode ended, I wanted to watch it again. If you haven't watched it at least once, I warn you that spoilers are ahead. Episode 2 concluded with Dr. Jason Wilkes tragically losing his life in the Isodyne explosion. Now the newspapers are calling him a communist. A search of his home turns up communist propaganda, which Peggy is convinced someone planted there. The evidence is far too obvious to be true, she argues. Someone is trying to frame the late physicist. It appears that "someone" is Hollywood starlet Whitney Frost. Somehow she survived the explosion of Zero Matter that killed Jason Wilkes. Whitney didn't make it out of the struggle totally unscathed, though. What appears to be a small scrape at first is drastically more. She wasn't just in the Zero Matter explosion - the Zero Matter explosion is in her now. Although Whitney claims to understand Zero Matter better than anyone, even she can't understand what is happening to her. She manages to cover it up while simultaneously keeping several other secrets. Among them is her true identity as the brains behind Isodyne and Zero Matter. I predict a new villain on the horizon. Move over, Dottie Underwood. There's a new blonde baddie on the block. The club has been trying to recruit him for years. Begrudgingly, Howard agrees to temporarily join so Peggy can get in. He arrives with typical Stark style and quickly disrupts the stuffy order of things. As the men-only club spirals into a "Code Pink" and is swarmed by women, Peggy uses the chaos to investigate and plant bugs. In the library, she discovers a secret study. (It's naturally hidden behind a bookcase, because how else would you enter an evil lair?) In this conference room, her eyes fall upon a newspaper. Dated for the next day. The headline declares Calvin Chadwick's political opponent has withdrawn from the election. Peggy quickly realizes blackmail is in play. She's nearly caught snooping around but an American accent and Edwin Jarvis throw off suspicion enough for her to escape. 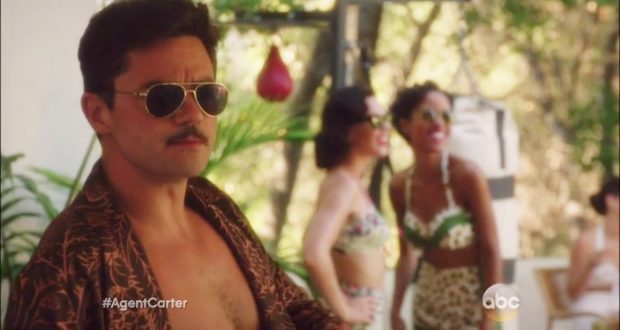 Seeing that the mission has been accomplished, Howard Stark announces that the club is terrible and he's never coming back. Recapping her findings, Peggy says, "The Arena Club knows what's happening because they're making it happen." Agent Thompson scoffs at her idea, especially when he finds out she couldn't retrieve evidence and all of the bugs malfunctioned. The overbearing chief reiterates that he had closed this case and refuses to allow Peggy to chase her leads. He also gets on my last nerve and makes me shout GO AWAY several times. There is a moment towards the end of the episode that makes me thaw slightly towards Thompson. Sousa is working late because he claims, "The early bird's got nothing on the night owl." Jack Thompson surprisingly seems to extend friendship to the other chief, or at least his version of it. It comes after he discovers Daniel is getting engaged and is therefore over Peggy. (Or supposedly. We'll see.) 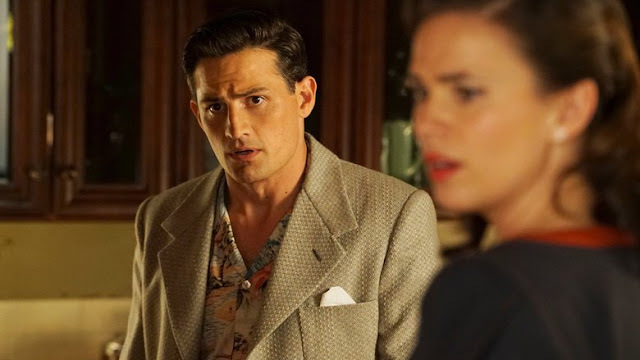 Thompson's change of attitude when he finds out Sousa isn't pursuing Peggy intrigued me against my will. Could the chief who demeans and undermines Peggy somehow have feelings for her? I'm still not on that ship but it's worth paying attention to. Even though Thompson isn't supporting the investigation, Peggy can't give up. 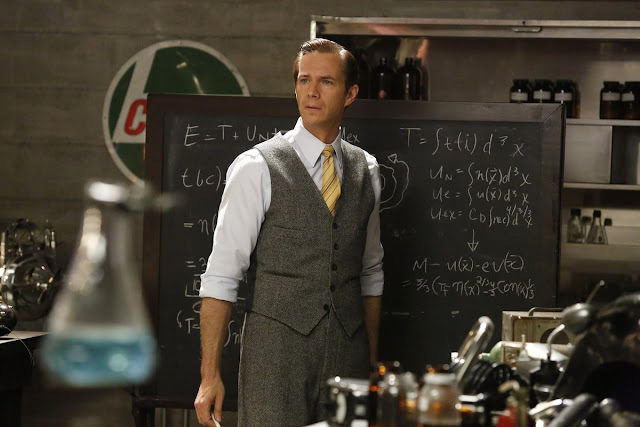 Howard is fully invested now and Jarvis would stand by Peggy until the end. Sousa remains involved too, albeit rather reluctantly. Peggy knows something is off with Whitney Frost and she takes an opportunity to interrogate the actress. Whitney keeps her composure but later alerts her husband that Agent Carter is on to them. Chadwick calls in his thug Mr. Hunt to handle Peggy. 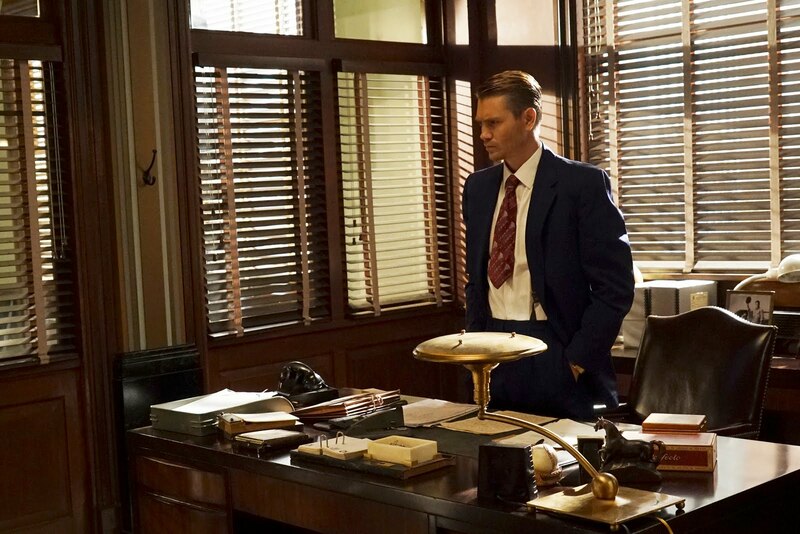 Mr. Hunt catches Peggy off guard when she's outside working off steam. She fights back brilliantly and Mr. Jarvis rushes out to her aid. It turns out that Edwin's workouts have paid off. Jarvis's skill set isn't limited to bodyguard, though. Howard would be lost without his butler. As Mr. Stark becomes more obsessed with the science of Zero Matter, he runs around asking Jarvis for coffee and velveeta cheese. Until this point, we haven't seen much of Mr. Jarvis and Mr. Stark's interaction. 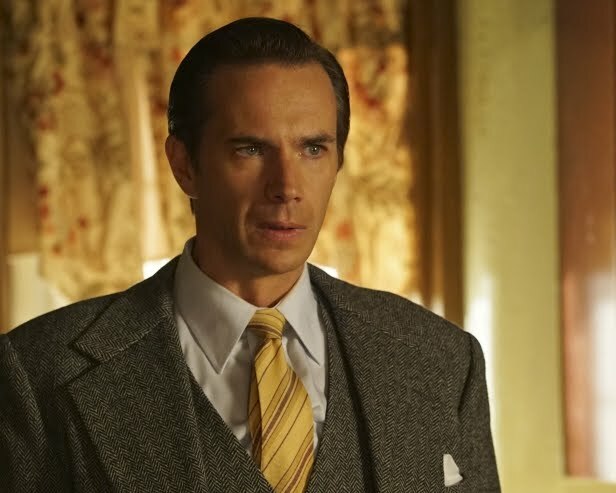 Jarvis has spent more time helping Peggy than Howard. I loved watching Edwin act as if he were Howard's long-suffering parent. Childish as he can be, Howard has his uses. When Peggy notices a disturbance in the gravity around her, there's a moment of anxiety. Has she been infected with Zero Matter too? Past observation shows that it eventually freezes people to death. 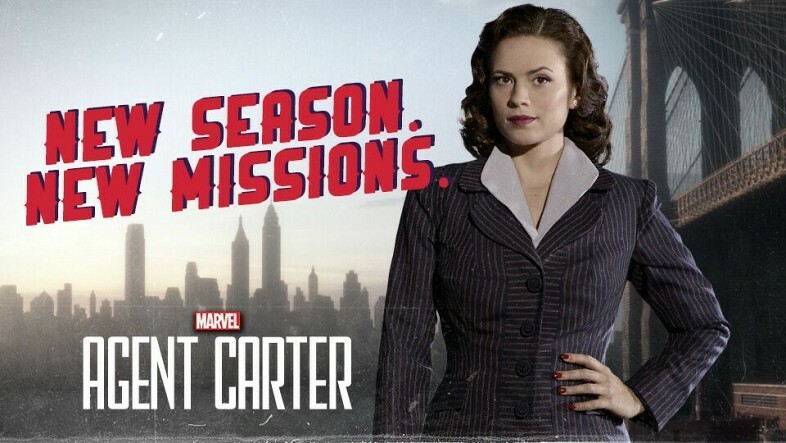 Will Agent Carter be the next victim? With his typical scientific flair, Howard puts this worry to rest. The disturbance isn't in Peg; it's around her. Combining his knowledge of science and film making, Howard reveals something shocking. Dr. Jason Wilkes isn't dead. He's trapped in a mysterious state caused by the Zero Matter and has been following Peg, hoping to get her attention. Howard devises a way to counteract the invisibility caused by this Zero Matter state, but it is to be determined if he can permanently restore Dr. Wilkes. Peggy is delighted to see Jason again and we get a bit more screen time of them. 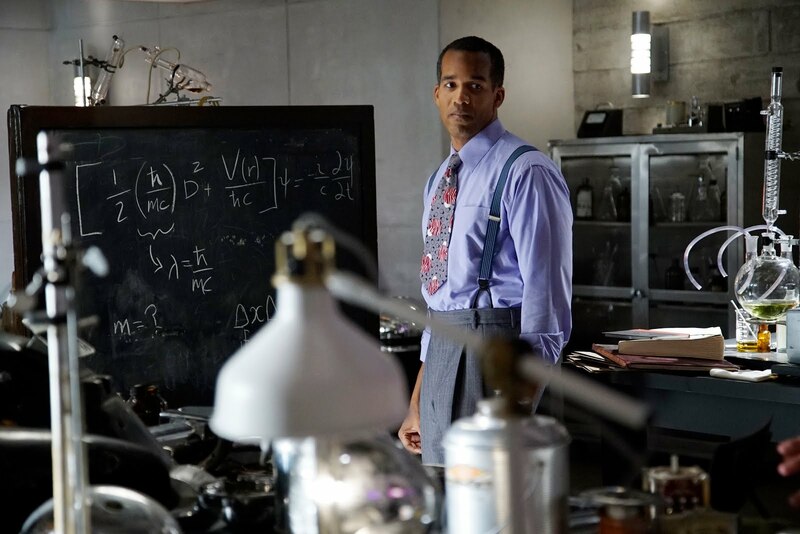 It's obvious the physicist has feelings for her and she's warming up to him in her own way. At one point, she pays him the compliment, "You've impressed Howard Stark and you've impressed me." I am still not shipping Jason and Peggy, but I am interested in seeing the physicist included more. I would extend Peggy's compliment to Dr. Wilkes to this entire episode. It impressed me and I can't wait to see what awaits us in Episode Four. Don't forget to tune in tonight! Over and out, agents.